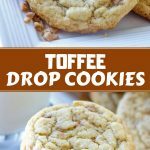 Toffee Drop Cookies are easy to make yet packs amazing flavor. 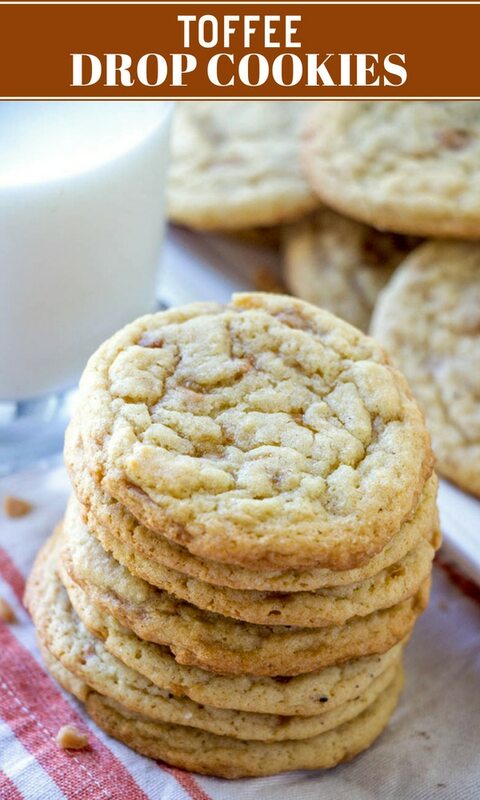 Chewy, buttery, and loaded with toffee bits, they’re a crowd pleaser! It’s August and I know it’s too soon to get excited about Christmas but time has a habit of whizzing by unnoticed so I thought I’ll get started with my holiday recipes as early as now. 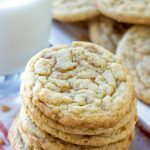 Since they’re a must on my Christmas baking every year, I want to reintroduce you to these toffee cookies I first published on the blog in December 2013. 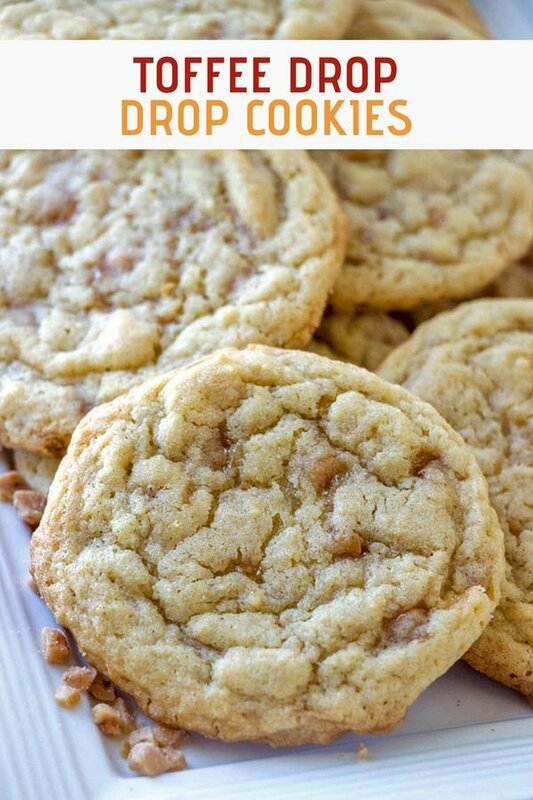 I’m sure they’ll be a favorite on your cookie list, too! Want to add a hint of chocolate flavor? In place of the toffee brickle bits, use chopped Heath bars which are coated in chocolate. For uniform sizes, use an ice cream scoop to portion the dough. The recipe makes about 36 pieces so you might have to bake in batches. Make sure to use room temperature baking sheets; if you’re using the same pan, cool it before putting the next round of dough by quickly running under cold water. 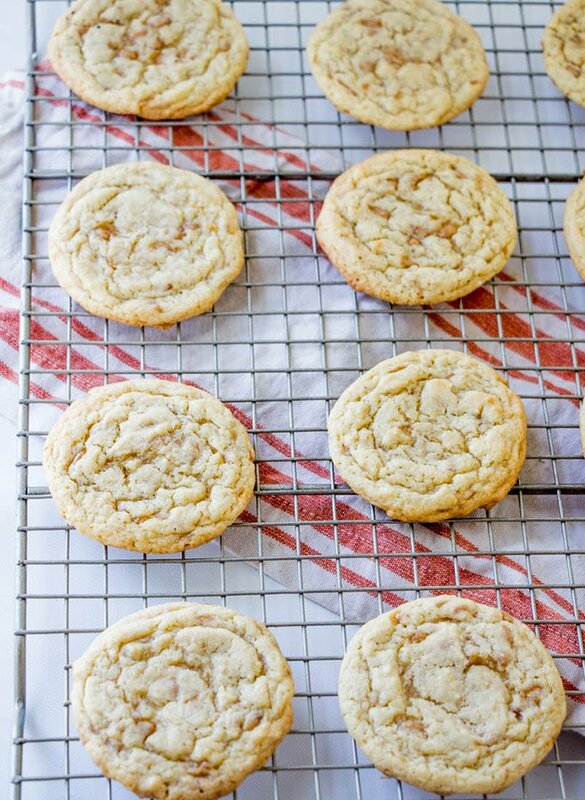 For soft, chewy texture, take the cookies out of the oven when the edges are lightly browned and the centers look slightly underbaked. They will continue to cook for a few minutes while cooling. 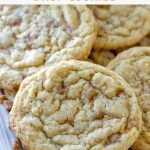 I have a favorite selection of cookie recipes such as white chocolate cranberry, Double-Rich chocolate, and flourless chocolate crinkles that will make a great addition to your holiday cookie swaps, but if there’s a cookie that will get you on everyone’s nice list, these toffee bits cookies are it! 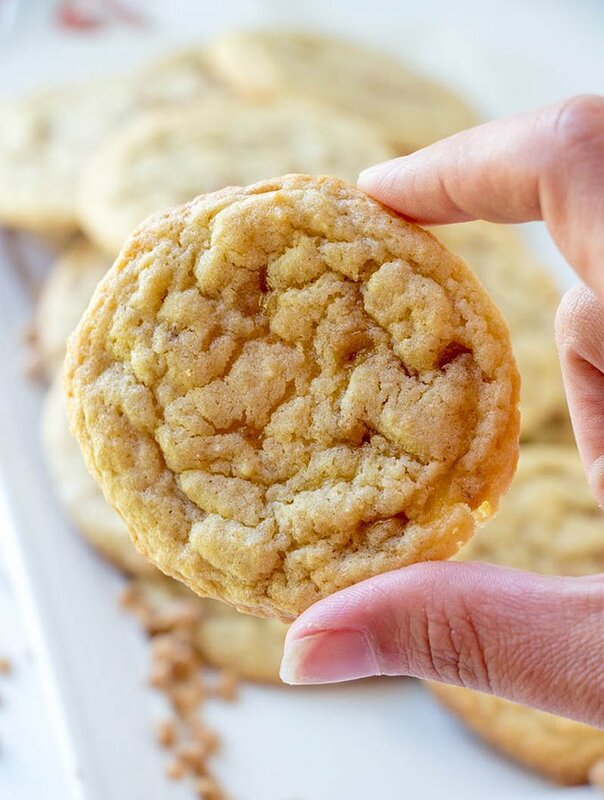 With crispy edges, chewy centers, and buttery flavor, they’re a guaranteed crowd favorite. 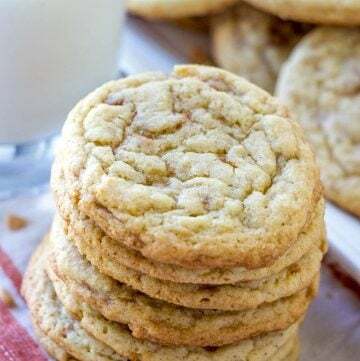 Every time I bake them for potlucks or gift-giving, I make sure to double the batch as there never seem to be enough left to give out after G and I take our share. We can’t get enough of these Heath cookies, we literally, seriously wait for the oven timer to beep with ice cold milk in hand! They’re so good, you’ll be hard-pressed to eat just one! Enjoy the cookies and see you tomorrow for a delicious Chicken Tinga recipe coming up! 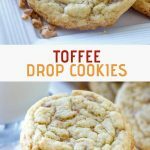 Toffee Drop Cookies are easy to make yet packs amazing flavor. 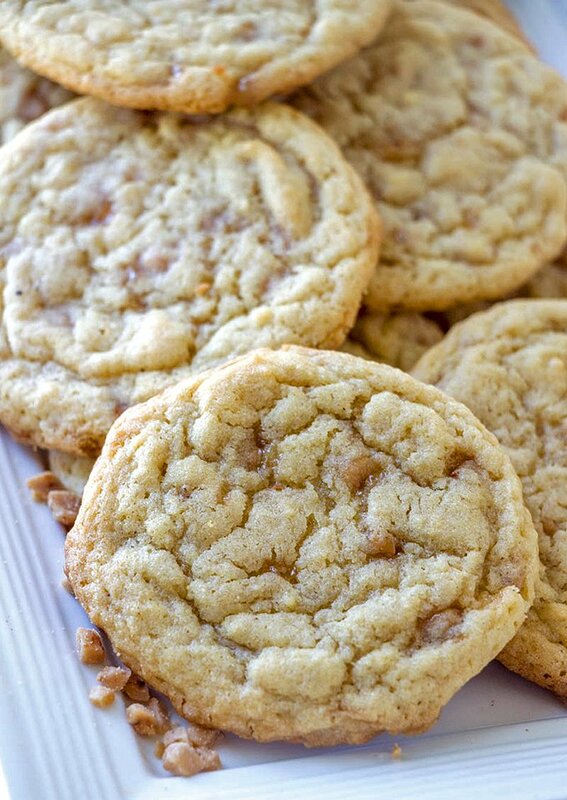 Chewy, buttery, and loaded with toffee bits, they're a crowd pleaser! In a bowl, combine flour, baking soda, and cream of tartar. 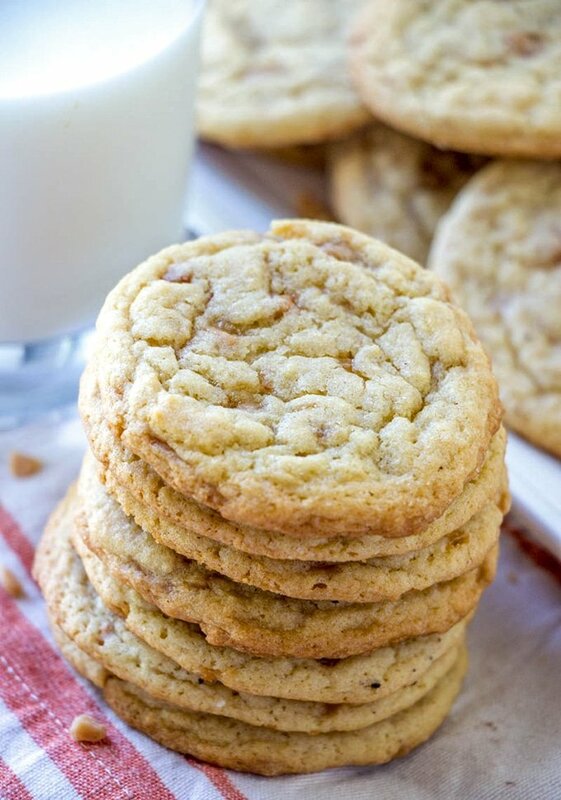 In a large bowl, combine butter, granulated sugar, brown sugar, vanilla extract, and salt. Using an electric mixer on low speed, beat until blended. Gradually add flour mixture to butter mixture, beating until blended. Add toffee bits and stir to combine. 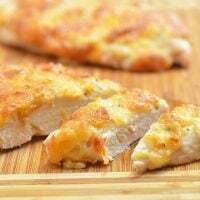 Using a scoop or a tablespoon, drop dough onto a lightly greased baking sheet about 1 inch apart. Bake in a 350 F for about 8 to 10 minutes or until lightly browned. Remove from oven, cool for a few minutes and transfer to a wire rack to cool completely.